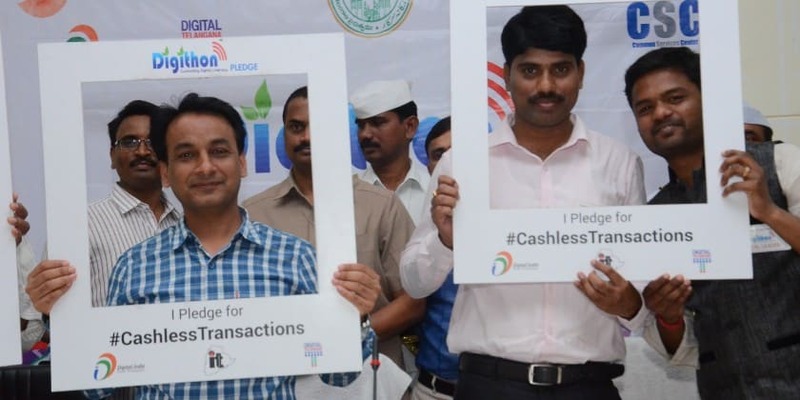 Following the successful completion of Cashless Yadadri and Cashless Bhongir projects on December ’16 and January ‘17, the Telangana Information Technology Association (TITA) has now transformed Nalgonda into a cashless town. The TITA team members took up the task of educating and converting 3500 merchants in Nalgonda to switch to cashless transactions on Saturday. The event was supported by Telangana Ministry of IT, CSC India, Nalgonda District Collectorate office administration, E-Wallet representatives. Total of 15 groups were formed with 120 TITA Digital Volunteers, representatives from e-wallet companies, Banks and a couple of State government employees in each group. Each group was assigned with the task of educating merchants in the designated areas, within the town on the usage of different e-wallets, POS and Aadhar” said TITA president Sundeep Kumar Makthala. “It is historic event and first time ever in Nalgonda district.” said District Collector Dr. Gaurav Uppal. Collector appreciates Team TITA for their continuous efforts in making Digital Telangana and requested TITA for long term association in digitalizing Nalgonda District. The event has been flagged off by District Collector Dr. Gaurav Uppal, Joint Collector C. Narayan Reddy, TITA President Sundeep Kumar Makthala. TITA Vice President Ranapratap Bojjam, Womens wing joint secretary Srilatha, organizing Secretary Vishwak , Spokesperson Venkata Vanam, Corporate relations Raju K and TITA GWC member Pradeep Nilgiri, DRO Kimya Naik, Suryam EDM Durga Rao, T Paramesh, Collector Superintendent Vernkateshwarlu were present at the event. Nalgonda Declared as Cashless Town 0 out of 5 based on 0 ratings. 0 user reviews.